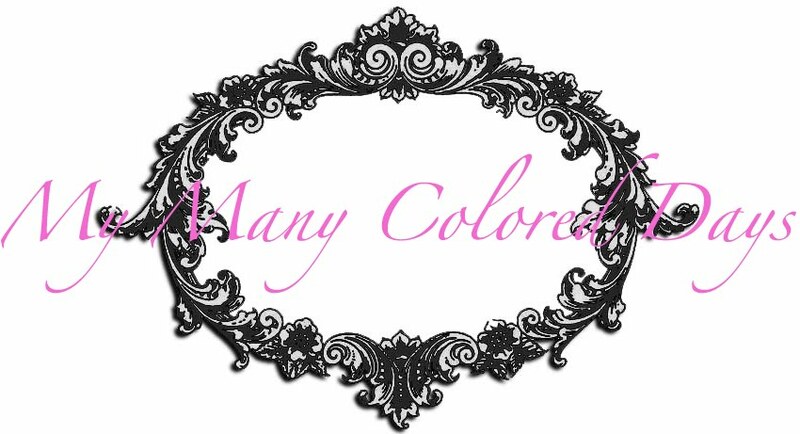 My Many Colored Days: Having creative friends, it's a good thing! Having creative friends, it's a good thing! Let's face it, the best ideas come from other great ideas. I do believe as Tolstoy said that "art is imitation". We have to have seen something beautiful in order to know how to recreate beauty. I am fortunate to have many creative friends. They inspire me and help get my own creative juices flowing. And we take care of each other... nurturing each other's ideas, helping bring them to fruition. Sharing our talents. Char at Crap I've Made recently recreated these awesome peace ornaments from PB. I had been eyeing some fun ornaments in the Ballard Designs catalog, so I followed her lead and recreated my own spin off incorporating the peace sign. 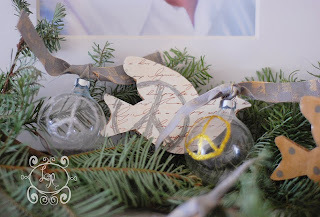 I even have a few simple clear ball ornaments along with that I simply painted peace signs onto using glitter glue (you know, the cheap stuff your kids like to play with?). Now I'm not as neat as Char. I didn't cover my edges or anything. I also don't do great, detailed tutorials with step by step pictures. I just don't like to, lol. But i will tell you exactly what I did, and I will show you more pictures and other ideas that have spun off this one. 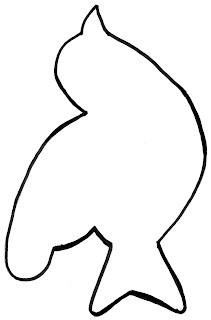 First, trace your template onto cardboard or other stiff backing. 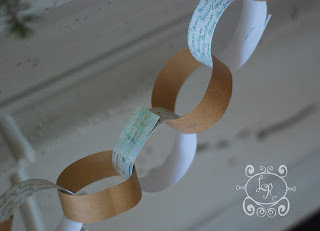 Cut out and repeat with your scrapbook paper. 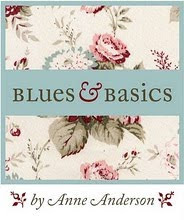 Now you are ready to cut out your scrapbook dove and mod podge it onto your cardboard backing. Now, I call these ornaments but mine are not actually hanging on my tree. 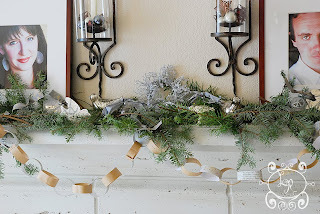 I opted to stick them in with evergreen boughs in various places around my house - in a bowl as a centerpiece, and on my mantle. 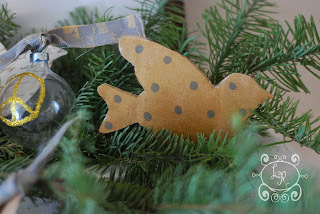 If you want it to serve as an actual ornament, you will obviously need to punch a hole before you apply the mod podge. Let the mod podge dry about 15 minutes and apply your triple thick as a top coat. let the triple thick dry for at least 20 minutes. The triple thick is shiny, so it makes the ornament look classy, not like you just slapped some paper on an old piece of cardboard! Love that. I agree--I'm grateful for those who are so creative. Nice work. 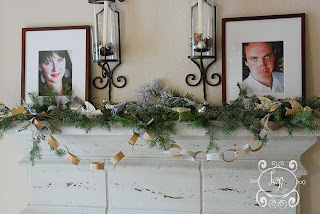 Your mantle looks great, s fun and different. Thanks for always being willing to share your creative ideas to help us get going too! love it, the music paper is so perfect for you. oh, i totally know what you mean about jeans. a girls gotta have good jeans. my fav right now are big star. love you, really wish you lived next door! I love the papers you chose and it was so nice of you to provide the template too. Cute and inventive. You did a great job and your mantle is beautiful. Cute and easy...great idea! Your Christmas decor was lovely! Your mantle looks amazing! So creative! Inspiring! Lovely - I'll have to keep that in mind this year. Thanks so much for providing the template you used. I love the ornaments! 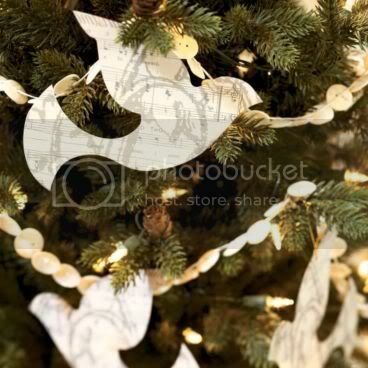 I love the brown paper and silver polka dot bird. I am loving all things using brown paper lately and am thinking my Christmas decorating this year is going to incorporate lots of it. If you want please link this up at my ongoing Christmas link up - http://inmyownstyle.com/christmas-in-july. 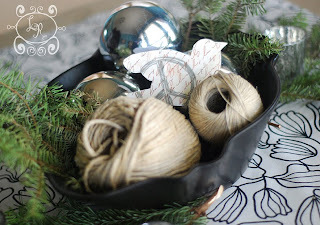 your ornaments are a great idea, so easy and so elegant. I will make some this year, and I am sure my daughter will want to make some too! 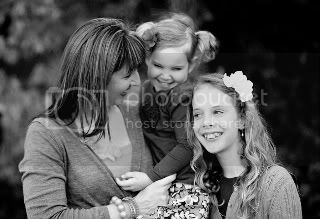 I will provide 3 images for each product ($40+ value) you send to me! (1 image for $20 or less value) Your product is my payment. It's easy as that. Contact me at photosbylei@yahoo.com if you're interested! I love to share my ideas and love it even more if it's worthy of your imitation. 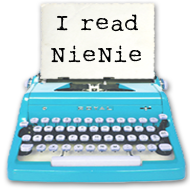 Feel free to link to or feature any ideas or projects on this site, but please link back to me! For more information, see the details of my copyright at the bottom of this page! On why I need designer jeans. 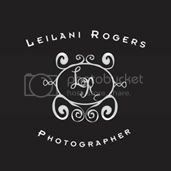 This work by Leilani Rogers is licensed under a Creative Commons Attribution-Noncommercial 3.0 United States License.